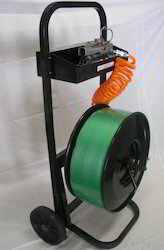 Our pet strapping machines are technically advanced and are easy in installation. Apart from this, we are also providing customized solutions to meet the specific requirements of the clients. Strap at quick speed and with high efficiency. Only takes 1.5 seconds for strapping one polypropylene strap. Instant-heating systems, low voltage of 1v, high safety, and will be in best strapping state in 5 seconds after you tart the machine. Automatic stopping devices, save electricity and make it practical. The machine will automatically stop and be in standby state when you don't operate it beyond 60 seconds. Electromagnetic clutch, quick and smooth. Coupled-axle transmission, quick speed, low noise, low wear and tear, and low breakdown rate.